The classic lamp table is reinvented in this modern interpretation. 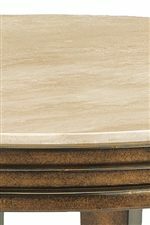 A round Spanish travertine top creates a subtle sheen on the table's surface, while a steel base in bronze complements the cool marble with a hint of golden glow. 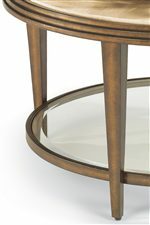 Four tapered legs join with a round glass shelf to complete the table's base. The Seville Round Metal Lamp Table by Flexsteel at AHFA in the area. Product availability may vary. Contact us for the most current availability on this product. The Seville collection is a great option if you are looking for Contemporary Contemporary furniture in the area. Browse other items in the Seville collection from AHFA in the area.